This is one of my favorite Christmas sets, Home for Christmas. Here I wanted to use one of the traditional Christmas colors, red. And of course I am using Chocolate Chip since I love that ribbon (now on the Clearance Rack)! Chocolate Chip, Real Red and Whisper White cardstock. To run the Real Red piece of paper through the Crimper. Pierce holes for 3 Vintage Brads, wrap around and knot ribbon, then adhere to card front. 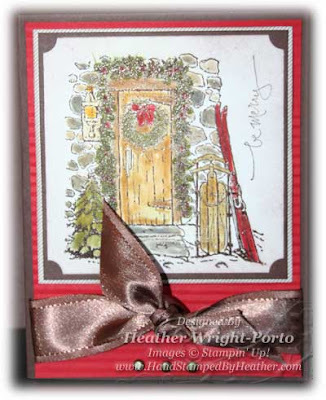 Stamp image on the 3-1/2 x 3-1/2 piece of Whisper White (punch corners), then layer on a piece of Chocolate Chip cardstock, then layer ontop of a 3-3/4 x 3-3/4 piece of striped patterned piece from the Christmas Cocoa Specialty Paper. Watercolor image using markers and ink pads. Meaning, open up an Ink Pad you want to use, such as Old Olive, then you can choose various markers as well, and scribble on the open lid, and use a Blender Pen to "blend" and prep to watercolor. So, if you had the markers but not all the Classic Ink Pads, you could still watercolor with any marker. This set (Home for Christmas), click here.